Quota International of Magnolia signed an endowment agreement and presented a check to the SAU Foundation on April 14, 2016. Pictured, from left, are Charles Hayes, husband of the late Norma Hayes; Quota member Lu Waters and Quota President Pam Schulz; and Jeanie Bismark of the SAU Foundation. 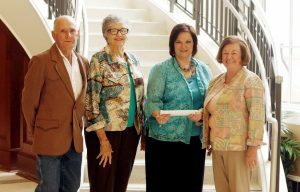 Quota International of Magnolia has established an endowment in memory of Norma Hayes through the Southern Arkansas University Foundation. The Norma Hayes Nursing Scholarship Endowment is to provide a scholarship for a nursing student from Columbia County. The endowment will be completed once it reaches $15,000. To contribute, donations can be made online www.SAUFoundation.org or by mail to 100 E. University, MSC 9174, Magnolia, AR 71753-2181. The Quota Club is planning a New Year’s Eve Gala as a fundraiser to help complete the endowment. It will be held from 9 p.m. to midnight on December 31, 2016. Hayes passed away on January 4, 2016, and at her memorial service a tribute to her life authored by Lu Waters was presented. 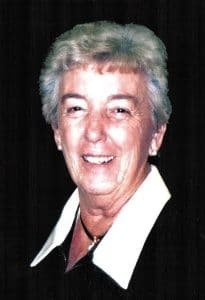 She served her community for 45 years as a registered nurse, including three years during the Vietnam War in a U.S. Army Trauma Burn Unit and 25 years as director of nursing at Magnolia City Hospital. She earned the Nurse of the Year Award, Outstanding Nurse Executive Award, and the Arkansas Hospital Association Chairman’s Award. She joined Quota Club of Magnolia in 1983, and graciously shared her talents of organization, leadership, and persuasiveness. She served as the club’s president two times and was awarded the Outstanding Quotarian of the Year Award twice. She also served two terms as Governor of the 23rd District and served as Lt. Governor and District Secretary/Treasurer. Hayes was a strong advocate for education, and all four of her children earned a college degree. It was for this reason and to honor her memory that the endowment was established in her name, according to Waters.